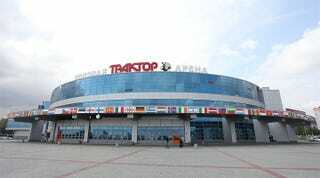 According to a statement, the Traktor Sport Palace—home arena of the KHL's Traktor Chelyabinsk—also suffered damage in the event. It's been temporarily closed, and will receive a full inspection over the weekend to determine whether it's safe to hold events. Traktor Chelyabinsk is luckily on the road, but is scheduled to host its first playoff game on Thursday. The meteor shower which struck Chelyabinsk and its environs has also caused some disruption to the hockey season schedule. The emergency services have confirmed that the walls of the Arena Traktor were among those structures to suffer damage, and therefore large-scale events at the stadium have been postponed. The sporting facilities will undergo an inspection by experts to assess the readiness of the arena to return to full operational use. At this time, the meteor shower has not affected Traktor's schedule, as the Chelyabinsk men finish their regular season campaign with a trip on the road to Magnitogorsk on Sunday. However, three events -today's and tomorrow's Youth Hockey League games between Belye Medvedi of Chelyabinsk and Magnitogorsk's Stalnye Lisy and Saturday's planned opening of the Traktor's museum - have had to be postponed.